As the year progresses and winter is still upon us but have you been wondering what seeds to start in February? Here in the desert southwest, we are so very lucky to have subzero temperatures. For those of you that are in the cold regions please keep warm and I will be saying a prayer for all of you. I have started some seeds inside. I have red corn growing and borage pictures are at the bottom of the post. You will see it after reading through the tools and seeds you’ll need to start seeding today. The seeds depend on what you want to plant. Plus the zone that you live in. If you don’t know your zone go to Check Your Planting Zone Here. To find your zone and what you can start your seeds indoors. You can also go over to your local nursery and ask the professionals there. I’m sure they can guide you on what you need. I can only tell you what I’m going to seed according to my zone. Here in the desert southwest, I have seeded some red corn, for popcorn. I have planted sorghum and regular corn and sweet corn to eat and popcorn, however, this year I found red corn from the store and I thought I give it a try this year. Red corn, I have never eaten any I’ve only heard from my elders who are faith healers and herbalist to know of its supernatural uses. Ward off evil spirits. But that’s a different post. These should get you started. Remember plant only what you are going to eat. I normally go plant happy and planted too much. I either end up giving them to my friends or having them bolted. Which it isn’t bad to give to my friends or having them bolted and having a forever garden. It’s just a lot of energy and time. I know garden lovers are saying it isn’t true and they love being outside. Me too! 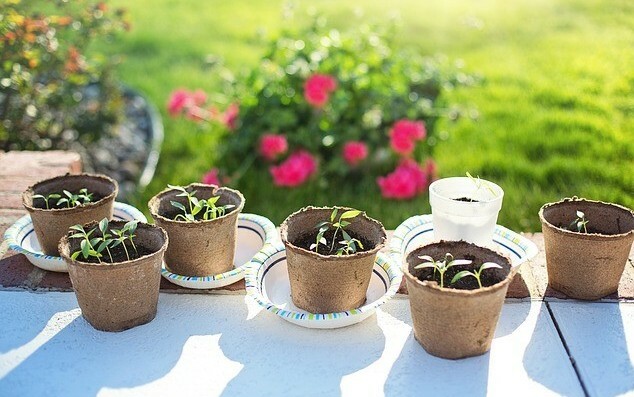 When it comes to sowing seeds I’ve always been a recycler of containers especially if I had purchased some sprout from the local nursery or big box store. I like to keep them for future use. That’s just me. You can go and buy some garden kit from an online store like Amazon. They have a plethora of kits and organic seeds. Or just click any of my affiliates links and they will be glad to help you out. recycled sprout containers you bought from the nursery. You can use anything that can hold soil or seed starting soil from the nursery. Read here for more ideas! Put your newly sowed seeds by a window cell or a place where it’s bright. You can also go and buy a growing light if you want. Soak the pepper seeds in room temperature water for 24 hours it helps it germinates. Keep soil at about 75°- 95° F (23.89°C – 35° C) Optimal would be at 85° F (29.4° C) Keeping your soil at the required temperature you would need a heating mate. You can even use any halogens light but wrapped it so no wind or cold could get in. I use a salt lamp as an experiment. Check out the YouTube video it has some great information on the seeds and what they are. Plus some plant cells he recommends. This is my set up. Please go and start seeding and tell me how it goes. What do you think of eating red corn? Have you tried making drinks out of the sorghum or planted any? I hope that this gives you guys an idea of what seeds to start in February. This is based on where I reside and my own experiences. Working outdoors and make mulch with fallen leaves my back aches and hurts from time to time. If you are in pain and would love to know how to relieve your aches comment on my post and I’ll send you a sample.